How Do You Fix a Roof That Has a Tree in It? It’s every homeowner’s worst nightmare. In the middle of a truly savage storm, you hear a giant crash and realize with a sick feeling that a tree branch has come down on your roof. While that kind of damage can leave you feeling vulnerable and shaken, it’s actually not the catastrophic crisis it seems to be. As long as your property has been well-maintained, your homeowner’s insurance should cover any roofing repairs needed. And while a fallen branch is certainly no joke, most don’t cause enough damage to require a total roof replacement. So what should you do if this unfortunate situation befalls you? And how do roofers repair damaged roofs anyway? Take a look below for the full scoop on fallen tree branches, storm damage, and roofing repairs. If a tree branch comes through your roof, your personal safety—and the safety of your family—should be your first priority. Don’t second guess yourself here. If you feel like the roof looks unsafe or like it might cave in, don’t hesitate to find a place to stay the night until the storm blows over. You’ll be able to better assess the damage when the weather clears up anyhow. Additionally, if the tree took down power lines as well, call the electric company right away. A live wire is nothing to take lightly. Your insurance adjuster will probably want pictures showing the extent of the damage. Snap some pictures now, before you begin removing the branches or cleaning up. However, never climb or walk on top of a damaged roof. You really can’t estimate the structural integrity of the surface, especially after it’s sustained that level of damage. Instead, prop a tall ladder against the side of your house and take all your pictures from there. Wait until the rain has stopped so that the ladder rungs don’t become slick and dangerous. Your homeowner’s insurance plan should cover any damage that occurs as a result of high winds. 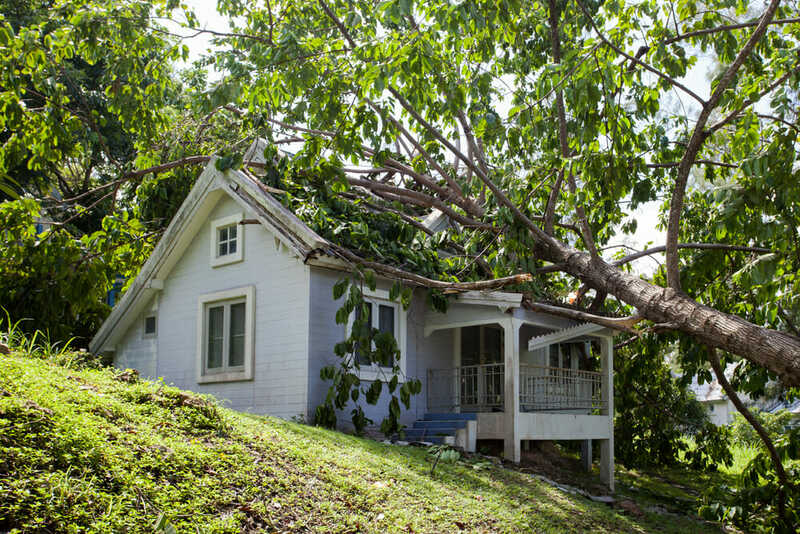 So if a healthy tree surrounding your home breaks during a storm and falls on your roof, your insurance company will generally take care of all the repairs after you meet your deductible. Some plans may even pay to remove the tree branch as well, although it’s possible you may have to spring for this part of the job yourself. That being said, however, there’s one major caveat. If the tree was rotting, diseased, or otherwise vulnerable, your insurance company may hold you at fault for the damage. For this reason, it’s important to properly maintain trees around your home—before they cause a problem. And your coverage should hold up even if the tree sat on a neighbor’s property. Your insurance covers your home, so any damages to your roof should be paid by your provider, not your neighbor’s, regardless of where the tree came from. Generally, your best bet for this is to hire a professional tree removal expert who can cut the tree into pieces and safely take it offsite. To save money, you can perform the job yourself, but keep in mind, it will include potentially unsafe conditions and heavy work with a chainsaw. Most homeowners are better off paying the extra $75 to $150 it costs to have a tree branch hauled off. When the removal service comes out to visit, they can also take a look at your existing trees and tell you if any additional pruning is in order to save you from more devastation next time a severe weather even occurs. 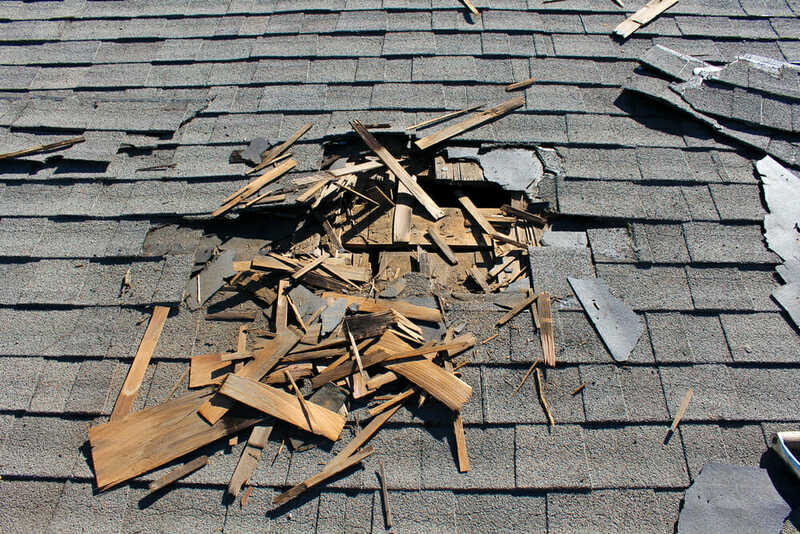 If the tree branch caused visible or obvious damage, most roofing companies will provide a free assessment to check out the scope of the required repairs. If you have major leaks or a caved-in roof, look for a company that offers emergency repairs so you can get it take care of as quickly as possible. However, even if the damage isn’t readily apparent, branches can cause punctures and subtle structural flaws that will take their toll on your roof over time. If you don’t see much destruction from the exterior, head up to the attic and have a look at the rafters there. If any of the rafters appear to be stressed, fractured, or cracked, have a roofer out to visit. Once you’ve confirmed that all the rafters look good, visually inspect the attic sheathing between the rafter boards. If any part is bent inwards, it will eventually lead to leaks and other problems, so this issue should be fixed as soon as possible as well. You can also perform another test to see if there are any leaks in your roof. Using a sprayer hose, thoroughly wet down the top of the roof, and then head to the attic to see if there are any obvious signs that water is getting in. A small leak may not seem like a huge issue now, but it can cause mold to grow, resulting in a costly remediation process. And the water damage can eventually rot your roof decking, necessitating extensive repairs. If your roof requires an immediate repair, your insurance company may have a list of preferred local roofers on hand to choose from—and may know of reputable companies available to come out to your home ASAP. Getting the name of a roofer you can trust is essential at this time. Emergency situations often draw scam artists who either do the work poorly and cheaply, take your money and disappear, or even in some cases, perform insurance fraud to make a profit at your expense. Most emergency roofers don’t expect full payment upfront for their services—so keep an eye out for anyone who asks. When the roofer arrives, they will help you take the necessary steps to cover the home with a tarp, make sure the house has not sustained any structural issues that put your safety at risk, and clean up water in the interior. The type of repair they perform depends on the scope of the damage. If the tree just cracked a few shingles, they may not recommend a full roof replacement. And of course, once you have the roof all shored up, you might want to have an arborist out to visit your home as well. He or she can make recommendations about your landscaping to avoid any additional issues with trees in the future. Because you shouldn’t have to go through the whole process ever again!